In spring, a young person’s fancy turns to thoughts of...software bundles. Two new Mac software bundles have arrived to entice you out of your hard-earned cash in exchange for ridiculously cheap, useful, and fun software. First up is the Mac Bundle Box, the purveyor of last year’s VoteBundle; they’re offering The Spring Bundle. This time around you can snag 11 apps, including Timer Pro, Clean Text, Cashculator, Blast, MacJournal (one of my personal favorites), PhotoStyler, Syllabus, Dropzone, Everplay, iCollage, and Transpod. A brief description is offered for each app, as is a trial download link, in case you need to try before you buy. 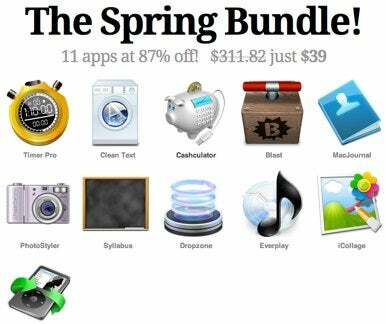 Normally, The Spring Bundle’s apps would set you back $312. But until Wednesday, April 21 at 11:59 p.m. PT, you can grab your very own copy for just $39. The second recent bundle is The Humble Frozenbyte Bundle. As with previous Humble offerings—like The Humble Indie Bundle 2—you can name your own price. The Frozenbyte bundle is a modest yet marvelous collection of cross-platform games, including Trine, Shadowgrounds: Survivor, Splot, and Jack Claw. As for doing some good while scoring some games, slices of your purchase price will be sent to the Electronic Frontier Foundation and Child’s Play, a charity that brings toys, games, and books to sick kids in children’s hospitals all over the world. At full price, the games would normally set you back $50, but you have until Tuesday, April 26 at 4 p.m. PST to take advantage of the discount. And if the spirit of competition helps encourage your generosity, know that the bundle crew also breaks out the average purchase prices across Mac, Windows, and Linux customers. So keep in mind when you’re deciding on your price that it’s in your power to help show what the Mac community can do in the name of good software and good causes.